Layer Chocolate-Strawberry Shortcake with creamy COOL WHIP, fresh berries and drizzled chocolate. 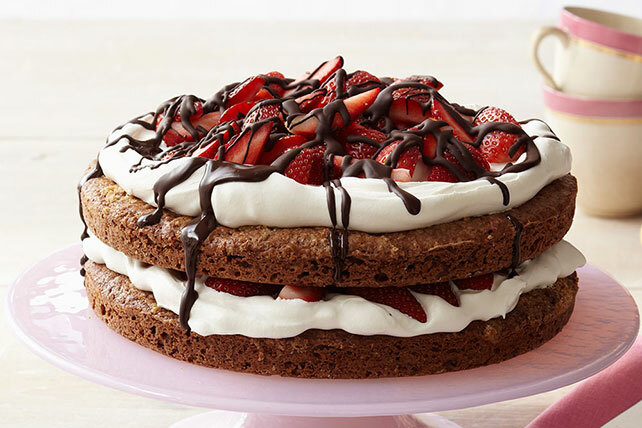 This Chocolate-Strawberry Shortcake is a showstopper. Mix first 4 ingredients in large bowl. Stir in 1/2 cup granulated sugar. Cut in butter with pastry blender or 2 knives until mixture resembles coarse crumbs. Add next 3 ingredients; mix well. Pour into 2 greased and floured 9-inch round pans. Mix 2 Tbsp. granulated sugar and the brown sugar; sprinkle over batter. Bake 12 min. or until toothpick inserted in centers comes out clean. Cool cakes in pans 10 min. Remove from pans to wire racks; cool completely. Melt semi-sweet chocolate as directed on package. Place one cake layer on plate; top with half each of COOL WHIP and berries. Cover with second cake layer. Top with remaining COOL WHIP and berries; drizzle with semi-sweet chocolate.